That is a line from the Little Women movie when Jo had cut and sold her hair for money to help the family. 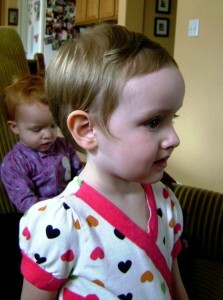 When Tara was three, she cut her sister Stephanie’s hair – just the bangs right in front. Stephanie was exactly one year old, had beautiful hair and now it had a”butched” area right in front! I was sad, but a little time and cute bows and barrettes in the meantime kept her looking like a baby girl. When Tredessa was almost three, she, whose hair was thick and curly and was already longer than waist-length when it was wet, lopped off a whole side of her hair. I had just had a baby. I sat on the stairs of our home and wept in deep sorrow (can you say ‘hormonal’?). It grew back. 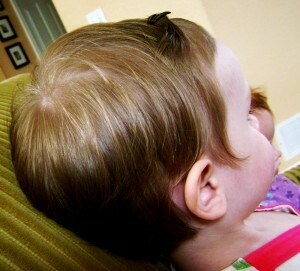 Gavin was three when he got ahold of some scissors and cut his hair short-short-short right next to the scalp. We had no choice but to shave that shiny, beautiful hair right off his whole head. Saturday morning Guini came down to breakfast and gleefully announced to her mama, “Look at my haircut,” as she stood there, sans locks, but with freshly cut hair and glossy lips (she calls it “lip sauce”). I think it looks great! You did a great job. She looks so cute! I can remember when Audrey cut her hair when she was around three. She cut her bangs just a little longer then Guini did. I was able to pull a little more hair down and blend the two cuts. After that the scissors were never stored below my head. 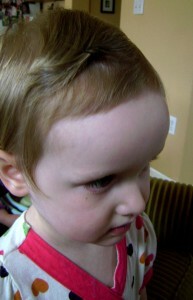 Remember mommies out there, keep the scissors high out of reach and don’t fret, the hair will grow back. Sometime thicker then before. I’ve been there and done that! Although my daughter did go to the scalp. It’s still a little traumatic at first, but the “pixie” is cute!